Published Jul 9, 2012 by Addison-Wesley Professional. Part of the LiveLessons series. 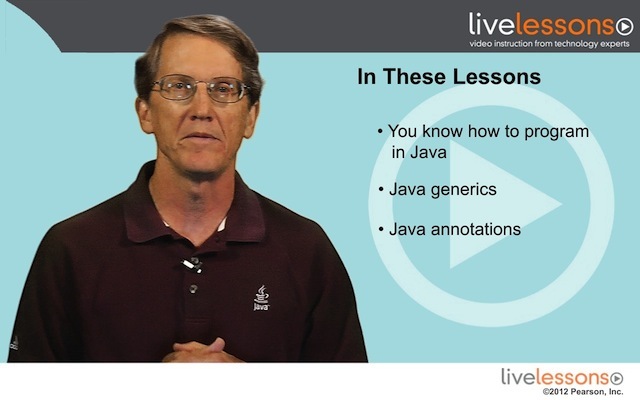 In 13 lessons, this LiveLessons¿video introduces the Java Reflection API and shows you how to use it effectively to write programs that take advantage of its powerful features.¿ ¿Bestselling Java author and trainer, Paul Anderson uses carefully chosen examples to demonstrate how reflection works without getting bogged down in the complexities often associated with this API.¿ Each key concept is explained and illustrated with source code listings that demonstrate how you can use reflection to solve real problems.¿ Key topics include discovering classes, interfaces, fields, constructors, methods, and arrays. Other topics discussed include creating objects, creating arrays, and working with fields.¿ This LiveLesson also covers generic parameterized types, annotations, and dependency injection. After completing this LiveLesson, you’ll be able to write more flexible code that takes full advantage of the Java Reflection model. In this lesson you will learn how to find classes at run time using Java Reflection.¿You will also learn how to work with Class<?><?> objects, how to access class names, class modifiers, and how to navigate class hierarchies. In this lesson you will learn how to find interfaces at run time using Java Reflection.¿You will learn how to determine which interfaces a class implements, which interfaces an interface extends, whether a Class<?><?> object represents an interface or a class, and how to find interface modifiers. In this lesson you will learn how to find class fields at run time using Java Reflection.¿You will learn how to find a specific field in a class or all the fields in a class.¿ You will also learn how to determine a field’s type, visibility, modifiers, and enclosing class. In this lesson you will learn how to find class constructors at run time using Java Reflection.¿You will learn how to find a specific constructor in a class or all the constructors in a class.¿ You will also learn how to determine a constructor’s parameters, exceptions, visibility, modifiers, and enclosing class. In this lesson you will learn how to find class methods at run time using Java Reflection.¿You will learn how to find a specific method in a class or all the methods in a class.¿ You will learn how to determine a method’s parameters, exceptions, return type, visibility, modifiers, and enclosing class.¿ You will also learn how to find the getter and setter methods in a class. In this lesson you will learn how to create objects without using new, “on-the-fly” at run time using Java Reflection.¿You will learn how to invoke a default constructor or a constructor with arguments.¿ You will also learn how to design factory objects with Java Reflection. In this lesson you will learn how to access class fields at run time using Java Reflection.¿You will learn how to read and write public fields that are class types or primitive types.¿ You will also learn how to access private and protected fields. In this lesson you will learn how to call methods without using their names, “on-the-fly” at run time using Java Reflection.¿You will learn how to invoke methods with no arguments or methods with one or more arguments.¿ You will also learn how to invoke methods that return values and how to invoke methods that are static, private, or protected. In this lesson you will learn how to find arrays at run time using Java Reflection.¿You will learn how to access Class<?><?> objects for one dimensional and multidimensional arrays of any type.¿ You will also learn how to identify arrays and determine their component types at run time. In this lesson you will learn how to create arrays without using new, “on-the-fly” at run time using Java Reflection.¿You will learn how to use the Array utility class to create one-dimensional and multidimensional arrays of any type.¿ You will also learn how to access Array elements that are class types or primitive types. In this lesson you will learn how to find generic parameterized types at run time using Java Reflection.¿You will learn how to find raw types and how to use Type and ParameterizedType to access generic types.¿ You will also learn how to use toGenericString() and find generic superclasses, interfaces, fields, method parameters, method return types, constructor parameters, and exceptions. In this lesson you will learn how to work with annotations at run time using Java Reflection.¿You will learn how to create an annotation with a retention policy for reflection and how to find annotations in your Java code.¿ You will also learn how to use the Java Annotation APIs to implement annotations for classes, fields, methods, constructors, and method and constructor parameters. In this lesson you will learn how to apply Java Reflection with examples of dependency injection.¿ You will learn how to design with interfaces and inject dependencies from XML files or with Java annotations.